Shabby chic decorating has been popular for quite some time now. It is a form of rustic chic or farmhouse style. The blending of rustic metals or wood with softer light materials is so appealing. 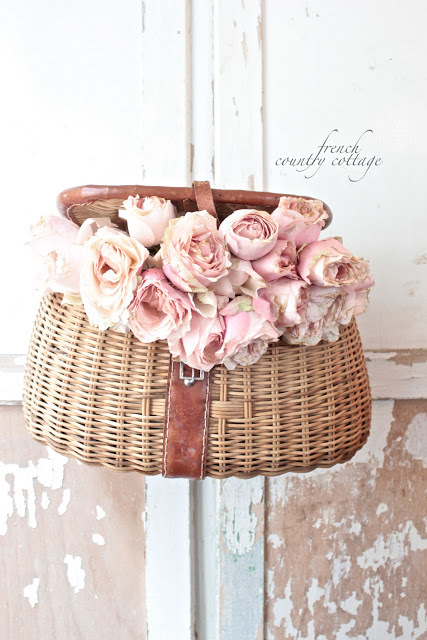 I am going to show you how to create this style with some great examples of DIY shabby chic home decor. This first example is something that I did real quick and easy. I had an old industrial parts washer basket that was a silver metal that was partially rusted. I have had other baskets that were fully rusted with a great looking patina where all I needed to do was put a lacquer coating on them and call it good. However, this one did not look good on it’s own. So, I sprayed a light coat of white spray paint on it and let some of the rusted spots show through. I then filled it with pip berries to add a little softness and had some instant shabby chic! 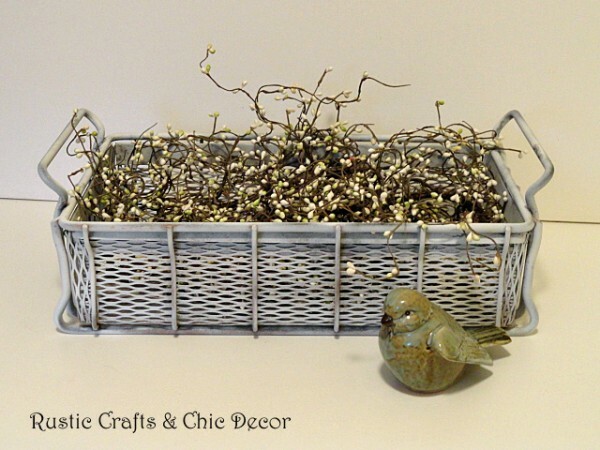 A little bird set in front of a basket is always a nice touch! I am in love with the idea of fishing creels and flowers! The bummer is that I sold a creel a while back that was about a hundred years old and super cool looking. Oh well, at least with an outdoorsman for a husband, we have others around! Do you like the look of old shutters for shabby chic decor but can’t find your own or have found some but they are too expensive or not the right size? 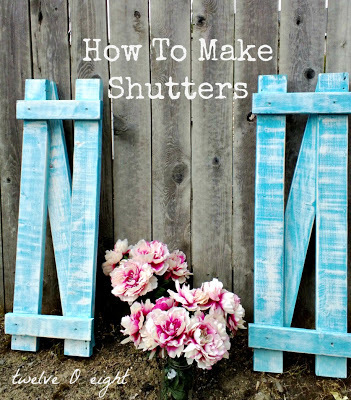 Well now you can make your own with this easy to follow shutter tutorial by Twelve O Eight. They are made to look just like vintage shutters and you can customize them just how you want. 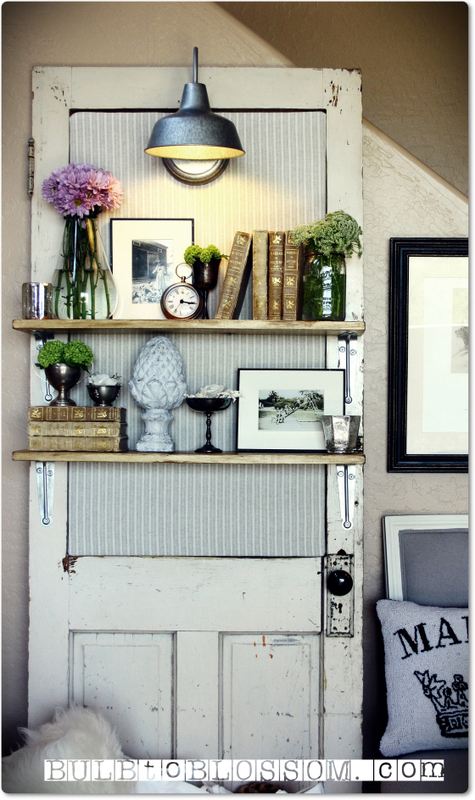 Here is a wonderful diy project for turning a shabby vintage door into a chic shelf unit with a light. 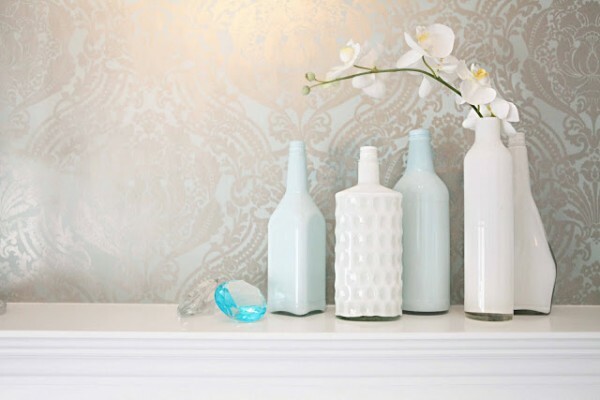 Milk glass vases are a popular vintage item to use in shabby chic decor. You can create your own look a like using the tutorial provided by Beach House In The City. Click on the photo to see the details. I actually just purchases several vintage milk glass vases for my daughter’s wedding. I’m thinking that if I want to add to the centerpiece arrangements, I can always try this! 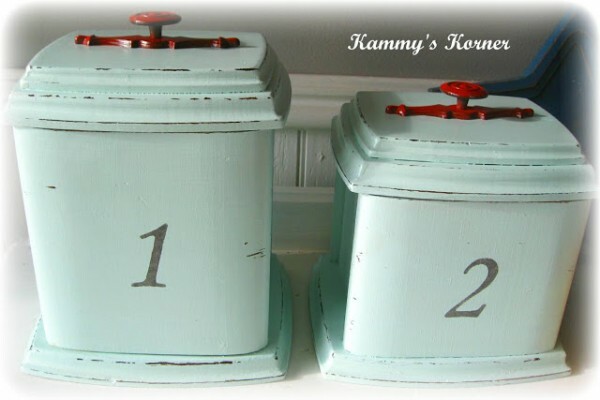 These canisters were given an amazing shabby chic look. You have to see the before picture on these! Although they were old, they didn’t have that awesome cottage decor look until after the transformation.